I am honored to be counted as a friend of Mildred, a remarkable woman. Recently, I received an invitation to her birthday party. This was not an ordinary party. 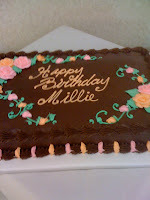 It was a commemoration of 85 years and 40 years cancer free living! I arrived early and had the privilege of congratulating the honoree and meeting her family members who came in for the celebration. 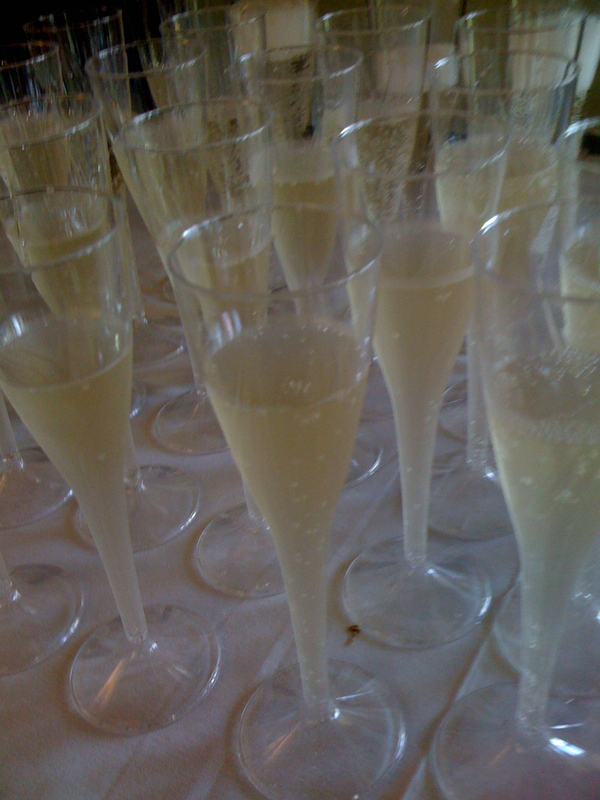 It was a lovely party. 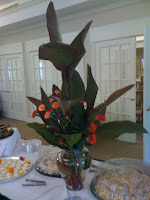 I am including some pictures of the refreshments and the flowers that graced the serving tables. 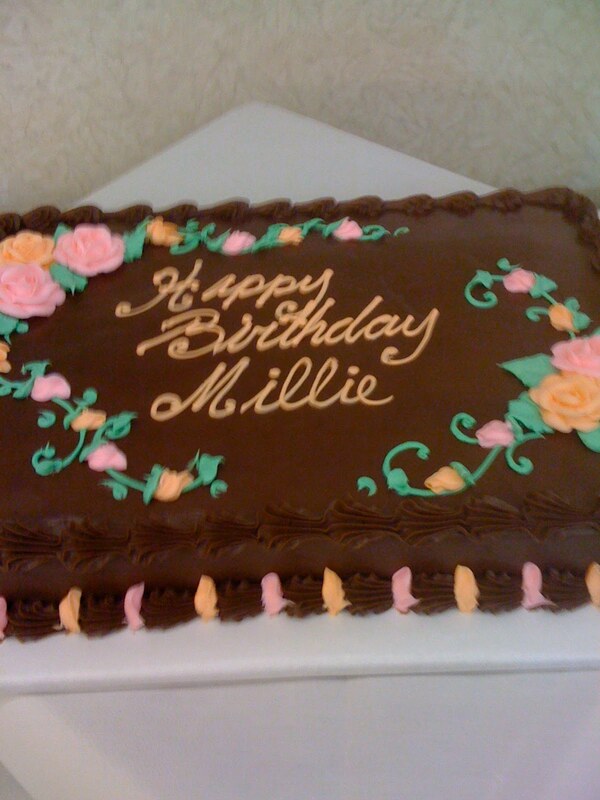 Initially I was surprised to learn that "Millie", as she is affectionately known to many, has her 85th birthday this year. If you met her, you would also be surprised. She is the youngest looking and youngest acting 85 year old I have ever seen. I have played many bridge games with her and she is smart and funny. Her positive outlook and busy schedule belie her chronological age. Mildred was born in Alsfeldt in Ontario, Canada and lived in Canada until she married. As a young person, she was selected to represent her church at a youth conference in Oslo, Norway. En route, her passport and money were stolen, so she never got there. However, her luggage was not held and it went by boat to Norway without her. She joked for years about her clothes that had a wonderful trip! She was a teacher for five years. Her marriage to husband, George, was 62 years ago and is going strong! He is a retired LSU professor. Mildred earned a degree in psychology and sociology in 1976 at the same time as one of her daughters! She is the mother of four living children. There was another child, a son, who died in infancy. She has eight grandchildren and she is very proud of all their accomplishments. Among the children there are two attorneys, a journalist and a CPA. One of the attorneys decided to become a teacher. Her adult grandchildren are also very accomplished. I met a few of them at the birthday party and found that they have also have a zeal for education. All are devoted to her. She is a member of University United Methodist Church and is proud to be a member of this close church family. The church "adopted" a school and Mildred volunteered as a mentor, a prayer partner and a teacher encourager at the school. She has also had several positions of leadership in the church during the years. In 1968 she was involved in a train accident. The signals were not working and she hit the engine. Her car was totaled and she was trapped in the vehicle. The policeman and firemen who came to her assistance remarked that she must be a "church lady" to have survived. It was not her time. She had lots of living to do! Since I met Mildred through a bridge club, I asked her about this hobby. She admits to playing in seven groups that play regularly. No wonder her mind is so sharp! It's so fun to be around her that I suppose she is invited to play for her good company and her excellent card skills! When Mildred hosts the bridge party, she always has wonderful desserts and snacks to serve. A couple of her recipes are shared below. She also loves to garden and feels close to God in her flower bed. She is also a bird and butterfly enthusiast. Added to her talents is singing. She has, in the past, been a soloist for her church. 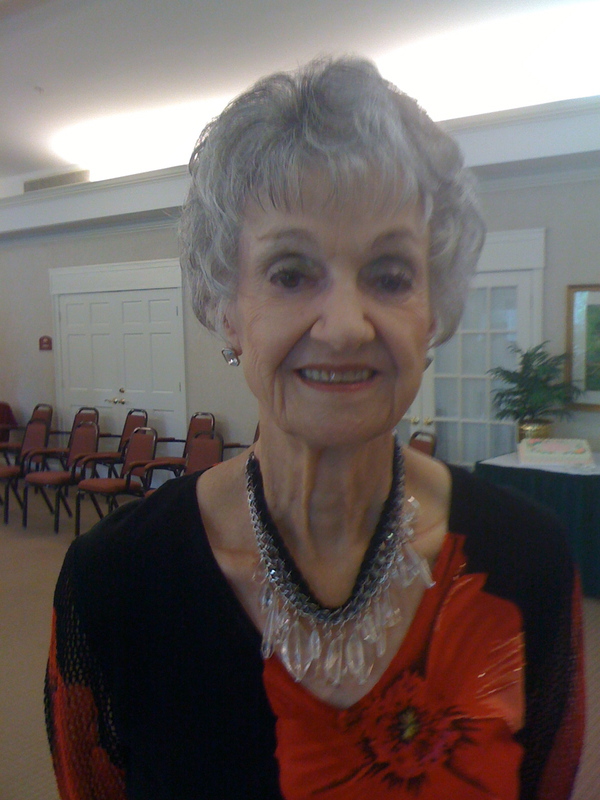 Mildred was honored by Mary Bird Perkins Cancer Center as the Outstanding Volunteer for 2005-2006. She volunteered there for 25 years. As a cancer survivor she could relate to patients receiving treatment for the dreaded disease. I wanted to know the secret of her full life and this is what she said: "It probably is no secret that my faith has brought me through the wilderness--the loss of a baby, colon cancer, a Down Syndrome grandchild--each one of these experiences help me to get things into perspective and to get my priorities in order. Each moment is a gift from God--given to me to spread His love. I thank my wonderful parents, salt of the earth people, for bringing me up in the Christian tradition." She added that her friends are an important part of her life. She is very happy to be living in St. James Place where "every one here falls over backwards" to take care of the residents and sees to it that each is living life well. Mildred is a beautiful person...inside and out! 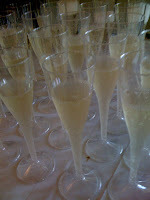 As I left the party, there was a huge crowd of people gathered to celebrate this special life. What a tribute to a wonderful lady! Happy Birthday, to a truly remarkable woman! 1. Using a knife, cut cheese spread into the flour and add melted butter to form a dough. 2. Shape balls of dough around individual olives. 3. Freeze for best results. 4. To Bake: place balls on ungreased cookie sheet and bake at 400 degrees until golden brown, about 15 to 20 minutes. These are convenient to pull out and bake for Happy Hour. 1. Bake a brownie mix. Let cool and cut into cubes for layering in a trifle bowl. 2. Spread one half of a can of cherry pie filling over half of the brownie cubes. 3. Mix one small package instant chocolate pudding according to package directions. Chill for a few minutes. 4. Spread half of the pudding over the cherry layer. Top this with half of an 8 oz. container of whipped topping. 5. Repeat the layers. Grate some chocolate to sprinkle on top! Pretty and delicious make ahead dessert and perfect for a bridge party.